Wanna be a Google Certified Innovator?! We’ve got five tips to help you! I am often asked what it takes to become a Google Certified Innovator, and it is not a one-size-fits-all answer like the other Google Certifications. The route to Innovator is different for everyone. I can’t teach a course or boot camp on this one. It is incredibly competitive, the most competitive of all of the certifications, and puts you in a family of an elite group of educators. 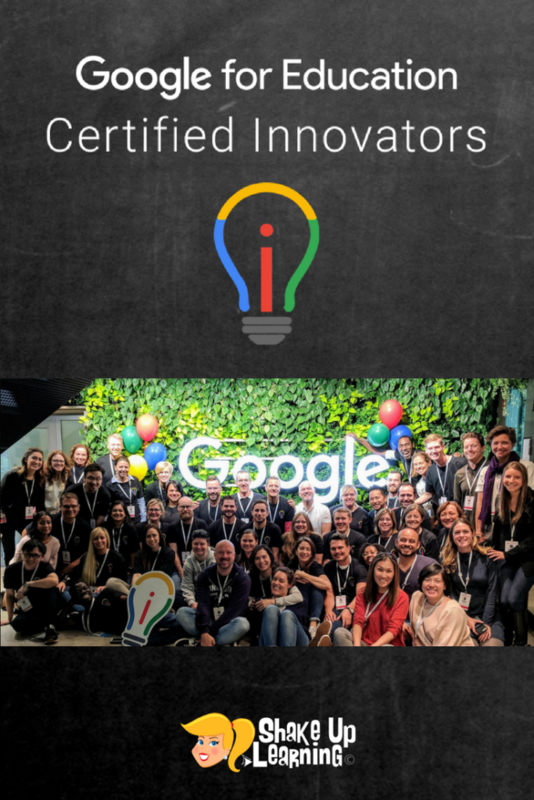 What is the Google Certified Innovator Program? The Google Certified Innovator Academy is a two-day academy designed for innovative thought leaders in education–those with passion, drive, and a commitment to transformation. The academy has a very competitive application process, and only a few make the cut. “Candidates for the Google for Education Certified Innovator program are selected based on their professional experience, their passion for teaching and learning, their innovative use of technology in school settings and their potential impact on other educators. They are ambassadors for change who empower other educators and students through a thriving innovation culture within their own classrooms, schools and organizations. Each certification has very specific requirements, to learn all about the application requirements for Google Certified Innovator, and all of the other certifications, download my free ebook: The Complete Guide to Google Certifications. The program has changed a lot since my induction in 2014 (#GTAATX), so I asked a colleague, Mason Mason, from EdTechTeacher, Inc., to write this guest post for Shake Up Learning. Mason recently attended the Google Innovator Academy in Stockholm, Sweden. Below, Mason share’s five tips on becoming a Google Certified Innovator. Below is a guest blog post from Mason Mason. Mason, M. Ed. is an Education Technology National Instructor with EdTechTeacher, Inc. and an Ed.D. student at Southern Methodist University in Dallas, Texas. He is passionate about helping educators transform teaching and learning through technology integration and closing the digital divide through equitable access to technology for all students. Connect with Mason through his website, www.edtechmason.com, and follow on Twitter @edtechmason. I did not always know I wanted to be a Google for Education Certified Innovator. I just knew I was passionate about helping educators improve teaching and learning and wanted to affect positive change for all students, not just the students in my classroom. As a classroom teacher, I was invited by the instructional technology department to present at a local education technology conference. They wanted me to share with other educators how I was using Chromebooks and G Suite in Education in my high school English classroom. The most challenging thing for me is narrowing down my passions. Tony Wagner, the Education Fellow at the Technology & Entrepreneurship Center at Harvard, says that our play leads to our passion which leads to our purpose. I have always liked technology and naturally incorporated it into teaching and learning, and once I bit the bug for facilitating education technology with adult learners, I found my purpose. What’s your passion? What’s your purpose? Let your passion take you to your purpose. Your purpose will drive your innovation project, but your passion will help you endure the process. Because I have many passions: education technology, global collaboration, and professional development (just to name a few), I selected the passion that drives my current work and helps fulfill my purpose: effective professional learning for educators. Certified Innovators are critical thinkers, problem solvers, and idealist. Your Innovation Project will be the manifestation of those ideas. You will be trying to solve a problem in education that positively affects many lives. But of course, that project proposal needs to be innovative. George Couros, the author of Innovator’s Mindset, defines innovation as a way of thinking that creates something new and better. Is your Innovation Project going to be new or, how is it going to improve on something that already exists? The Innovation Project is the soul of the #GoogleEI program. Innovators have a mission and vision, go through the design process, work with their cohort, and are partnered with a coach and mentor who has been through the process. They share (a lot), have a growth mindset, use failure to propel them to success, and possess an immense amount of grit. Start thinking about your Innovation Project early and often. When I decided I wanted to become a Google for Education Certified Innovator, I began looking at other Certified Innovators projects. I watched their Vision Videos, reviewed their Vision Decks, and spoke with them about the process and their projects. I had real models, ideas, and resources I could use to guide my thinking in developing and perfecting my innovation idea. The fact of the matter is, once you complete your Vision Deck and Vision Video, that’s only just the beginning. Shake Up Learning has a YouTube playlist with some of the accepted Google Innovator application videos. Before submitting my application, I shared my ideas, vision deck, and vision video with several colleagues, mentors, and current innovators to elicit feedback. Their feedback helped me refine my thinking, elaborate on my ideas, and helped me clear up any misconceptions/misunderstandings in my application. I’d recommend having at least two other people review your materials before you submit your application. Here is my Vision Presentation that I submitted with my application. Below is my application video or Vision Video: Plane PD. Keep in mind that being accepted to attend the Innovator Academy is only the first step in this year-long professional development process. And if you are not accepted your first time, don’t be discouraged and don’t give up. Fail forward, use this as a learning experience to propel you to success. The same growth mindset we instill in our students must drive our will to succeed with grit, perseverance, and determination. Just don’t make the mistake I made: applications are usually due before midnight based on the local time of where the academy is held. I erroneously thought it was midnight my time, and missed the deadline, so I had to wait to apply to a future cohort. I hope these five tips help prepare you as you travel down the road to becoming a Google for Education Certified Innovator. Remember, the journey is not always easy, but it’s always worth it. I look forward to connecting with you and can’t wait until you join the #GoogleEI family. Be sure to check out Mason’s blog post about his experience at the Innovator Academy, reflections, pictures, and more. Mason was also a recent guest on The Google Teacher Tribe Podcast, where he shared the experience with the Tribe in episode 28.